Add a splash of the tropics to your Jeep with a Mopar 68084123AA Jeep Islander decal from JustforJeeps.com. 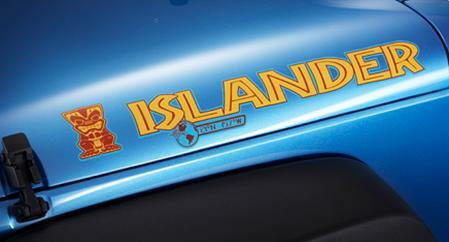 This colorful red and yellow Islander sticker is designed for the curve of your hood, just above your fender. It features a tiki and a globe with latitude lines of 21 degrees N and 157 degrees W; that's just under 7 miles southeast of Molokai on Maui. These Islander decals are sold individually. Islander decal for the Jeep Wrangler. For a complete set please order two.